With accreditation coming up (again!) at work I've been too busy to write up all the badges I'm getting. Here's 5 different beers across 7 badges to ease you into the week. There's a few familiar ones and a few new ones for your perusal. 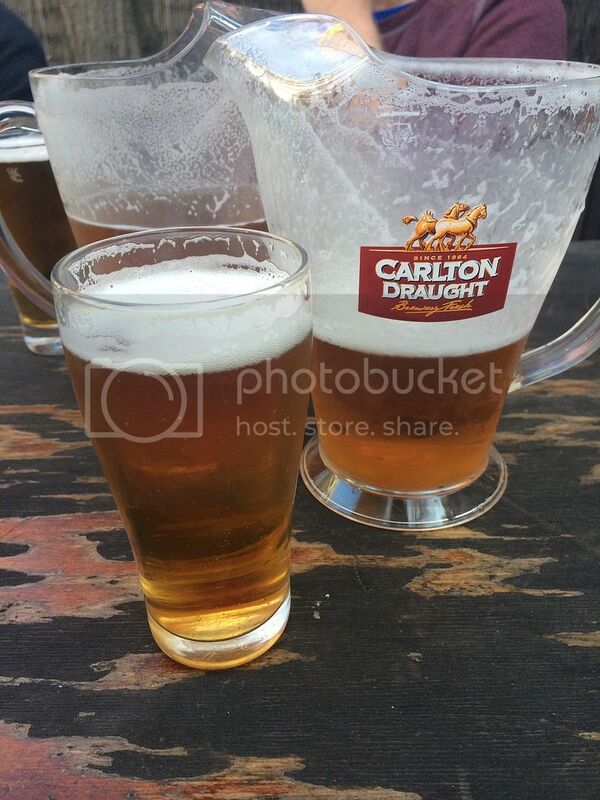 Carlton Draught has earned many a badge over the years, although this one was unexpected... Pale as Moon is normally reserved for Pale Ales, however at the footy the other night my first Carlton check-in ended up earning (Level 50). Whether it was a glitch or not I'll take it. A beer I did manage to review in full; Nomada's Royal Porter, earned two badges! Sky's the Limit (Level 8), for drinking beers above 10% ABV, and Flamenco, for drinking Spanish beers. You can read my full review here if you haven't already done so, it's a beer I'd look out for. Founders Brewing are long term supporters of Untappd, having sponsored a number of badges in the past. This time it's for their wonderful fruit beer, Rübæus. The mix between it's initial raspberry sweetness and then subsequent sourness is wonderfully refreshing. The badge is called "It's pronounced roo-bay-us", to my mind because so many people would wonder how to say it's name! It also earned a new core badge, Tea Time, a badge for drinking beers between 4-6pm. I've been lovely the fresh beers from Stone Brewing that landed recently. Another one to earn a badge is their Go To Session IPA. Coming from Stone it was always going to be wonderfully bitter and was packed full of grapefruit and pine flavours. Like with many session IPA's the body of the beer is a little thin, however it doesn't hurt this beer as much as it hurts some others. The badge was Hopped Up (Level 9). These Hopped Up badges really are coming thick and fast! Less than a day after Stone's Go To earned Level 9, Bacchus' Riwaka Single Hop IPA earned Level 10! It wasn't my favourite IPA from the Bacchus range, but it did showcase the citrus and spicy characteristics of the Riwaka hop very well. You can read about my adventures with the Bacchus NZ Single Hop IPA range here & here. So there we have it guys, that's another Untappd Catchup knocked over. This week I'm going to endeavour to try and write something everyday to try and unwind after work. We'll see how that goes though... In the meantime let me know what you guys are drinking or any thoughts on any of the beers mentioned here.